This dish was inspired by an animated movie about a rat who loves to cook, you know the one (one of my favorite movies). Not only did the rat love to cook, he cooked by instinct, not by recipes. I have nothing against recipes, but when Aunty P was teaching me how to cook (a long, long time ago), she taught me more about the process of cooking than actual recipes. Since then, I have been experimenting, and cooking through trial and error more than following recipes. I like to look at recipes and use them as a starting point to add my own twists. Another reason I’m not calling this dish ratatouille is that in one episode of No Reservations, Anthony Bourdain attempted to make ratatouille while visiting Provence, France. 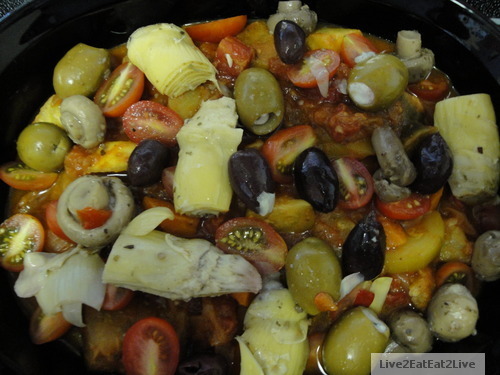 The people he was cooking it for (natives of Provence), declared that he made a good vegetable stew, but not ratatouille. If Anthony Bourdain’s attempt was not good enough, how can I even presume to come close. My cousins P & B invited us up to their house for dinner with Aunty M. I offered to make the vegetable stew (Version 2.2), which was readily accepted. By the way, Aunty P was P’s mother, so I had the additional pressure to cook something more than decent. 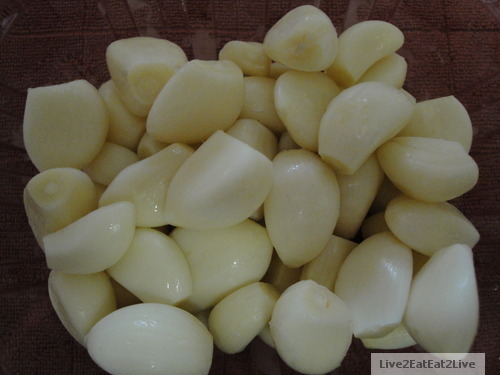 I started with several cloves of garlic. Our Korean market sells garlic cloves that are already peeled and cleaned. This saves my hands from smelling like garlic. 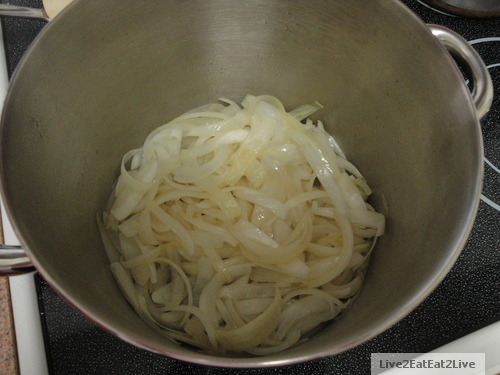 I pan roasted sliced onions over low heat until they were soft. About halfway before the onions were done, I added the garlic and continued to let both continue to cook until extremely soft. I added tomato paste, diced canned tomatoes, sliced zucchini, and eggplant. After everything simmered until done, about 45 minutes, I took the pot off the heat to cool. While the stew was still warm (halfway between hot and room temperature), I added grape tomatoes (halved), and an assortment of olives, marinated artichokes, and marinated mushrooms which I picked up from our neighborhood Safeway store (which has a self-serve olive bar). B gave it her stamp of approval and had the leftover for breakfast the next day. Was the stew “authentic?” Probably not. Was I trying to be “authentic?” Definitely not. For me, part of the fun is getting inspired by food and putting my own twist on it. Along with salt and pepper, I used basil, marjoram, and oregano for seasoning. The Mouse was inspired by a rat, how appropriate, thanks Remy.